Lighthouse Dynamic Direct View LED Series Expands with 80-inch Stretch and 104-inch Standard Models | KMB Communications, Inc.
Costa Mesa, CA (May 2018) – Lighthouse Technologies Limited, a leading global brand in direct view LED video display solutions with a 20-year history in the USA, expands its lineup of Dynamic Direct View LED Series of fine pitch direct-view LEDs for InfoComm 2018 with a 104-inch diagonal (16:9) and an 80-inch stretched aspect ratio screen. Mirroring the simplicity of ordering an LCD display or TV, the new Lighthouse Dynamic Direct View LED Series displays ship as complete, preconfigured units. Modules inside Dynamic series displays are cable-free and can be serviced from the front via a magnetic tool. Easy to specify, install, and maintain, the affordably priced Dynamic Series stands above competitors’ solutions for its tremendous value and versatility. LCDs dominate the conversation for most display applications but for big images, the future lies in fine pitch direct-view LEDs. Now, integrators have more choices in this cutting-edge technology with two new sizes in the Lighthouse Dynamic Series. A 104-inch diagonal model with a 16:9 aspect ratio fits squarely between the existing 89-inch and 118-inch models to meet the needs of many digital signage, retail, and hospitality applications. A stretched aspect ratio 80-inch version for specialty applications is perfect for wayfinding, restaurant menu boards, and other areas where a panoramic display can help designers convey information in an eye-catching, relevant format. Dynamic Direct View LED displays offer simplified plug and play integration and connect to standard video sources via HDMI. Each display includes a built-in media player with Wi-Fi, LAN, and USB connections for the ultimate flexibility and content options. Each display comes with a content management system (CMS), and includes scheduling tools plus a group of pre-designed templates, making it perfect for digital signage applications. The Dynamic is priced competitively with comparably sized flat panel configurations and makes it easy to specify fine pitch direct view LED displays. With a rich history in commercial integration and large-venue display technologies, Lighthouse leads the competitive pack for indoor and outdoor direct-view LEDs. Visit InfoComm 2018 booth N3354 in the Las Vegas Convention Center June 6 – 8, 2018 to see the new Dynamic Series models, along with other Lighthouse LED solutions. 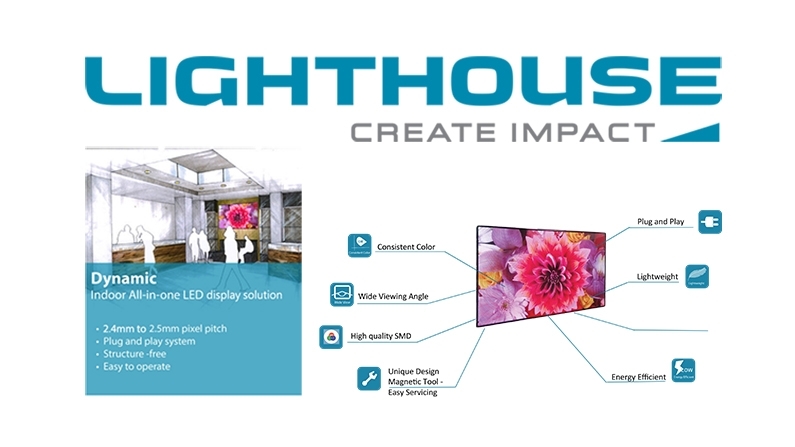 Lighthouse Technologies Limited, with U.S. offices in Costa Mesa, CA, is a global leader in LED video display technology, with regional offices around the world. Since 1997, Lighthouse has been developing, manufacturing, and marketing LED video display solutions for multiple indoor and outdoor applications, media and entertainment events, and sports arenas across the globe. Boasting numerous technological breakthroughs, including the new Dynamic series and Q-Series indoor direct view LED screens, Lighthouse is a multi-award-winning leader in the LED video display industry, employing the most advanced technology, highest quality manufacturing facilities, and world-class, round-the-clock technical support. Connect with Lighthouse on Twitter, Facebook, and LinkedIn, or to learn more visit www.lighthouse-tech.com.